Belmont Park Racquets Club has been part of the North Shore community since 1935. The Club prides itself on promoting values that emphasise fun, fitness, competition, respect, responsibility and success. Through a strong and committed volunteer base, it has developed well-organised programmes to encourage participation at junior and senior levels. These programmes are offered all year round in a safe and positive environment. In 2018 the Club was crowned Squash Auckland Club of the year. In 2010 the Club was recognised for its focus and achievements with tennis in general, and junior tennis in particular, when it was named NZ Tennis Club of the Year. 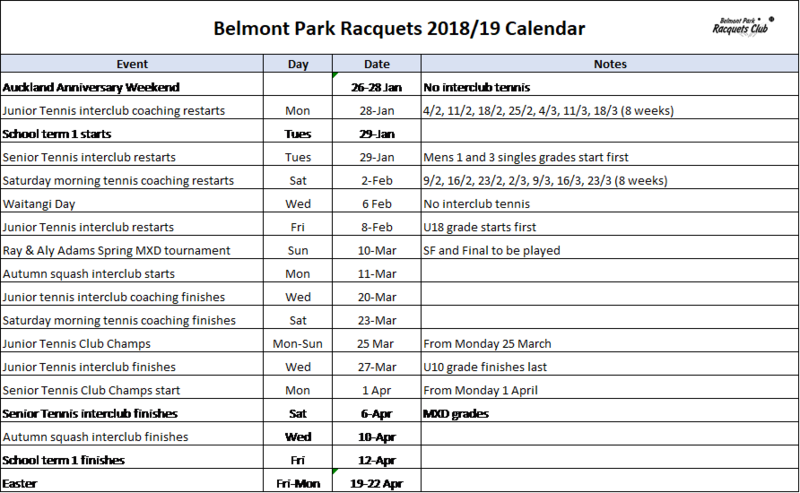 View our most recent club newsletter to see what's been happening at Belmont. 2019 Senior Tennis Club Prizegiving is set for Thursday 13 June - lock it in your diary everyone. This is a way for both our Club and our members to collectively save money on our power bills, and then for the Club to earn a further rebate per member that joins the programme, to invest in improving the Club's facilities. Join up and support us!